Spelt (Triticum spelta) is a hexaploid wheat species. It is closely related to our common wheats. Genetically it is not possible to differentiate wheat and spelt, particularly as both were always grown in the same area and spontaneously crossbred. 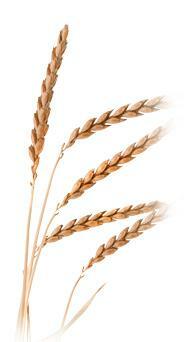 Spelt has originated from T. boeticum, T. speltoides, T. tauschil, and common bread wheat. Since when wheat and spelt are spoken of as independent varieties is not known. In the Middle Ages, spelt was cultivated in parts of Switzerland and Germany. It earned a level of recognition with the famous healer Hildegard von Bingen (1098 - 1179) using spelt as a panacea for many illnesses. A hundred years ago spelt still was a very important bread cereal in Southern Germany, parts of Austria and Switzerland. But it completely was replaced by common bread wheat. While there may have been many reasons for this agricultural shift, one is that spelt's nutrient-rich tough husk makes it harder to process than wheat. Lately the organic farming movement revived its popularity as well as the circulation of the ideas of Hildegard von Bingen. Spelt was cultivated on a moderate level in the United States until the beginning of the 20th century when farmers turned their efforts to the cultivation of wheat. Spelt is cultivated in limited quantities mainly in Central Europe. Spelt is recently receiving renewed recognition. Spelt can be used in many of the same ways as wheat including bread and pasta making or for the production of biscuits crackers.